These are magic socks. The toes are grafted so there are no nasty, pain-making seams across the toes. They seem to fit no matter what as long as you think lovingly of the person you’re making them for. 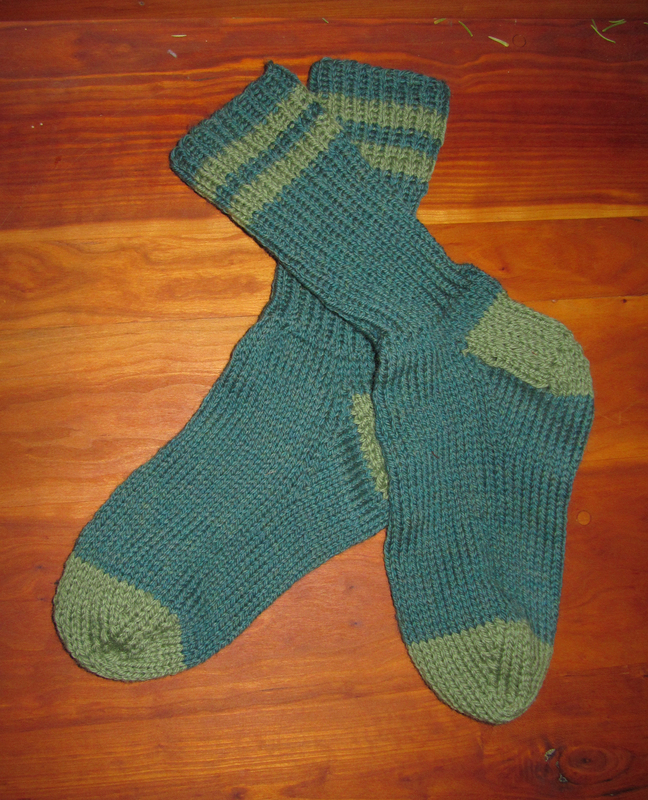 I first saw this sock pattern being knitted by my dear friend and splendid artist, Irene. Upon learning that there were no nasty, pain-making seams in the socks I immediately wanted to learn how to make them. I hadn’t knitted anything since I was about ten when my mother taught me to knit scarves, but I assured Irene that I was good at knots and she agreed to teach me. I got the pattern quickly but it took me a couple of pairs of socks to understand Irene’s instructions, “Don’t twist the stitches or your socks will become “hard” and unwearable.” There were also a couple of phone calls where Irene very patiently tried to teach me to knit socks on the phone. Irene is truly a good and patient teacher. I’ve been knitting socks for over ten years now. I’ve learned how to indefinitely patch them; how to remove an un-patchable foot so the cuff can be reused; how to modify the pattern for exact fit (Irene’s modification is to knit1, purl1–instead of knit2, purl2–the cuff). I’ve perfected my sock-making and now, like Irene, I’m often asked by people if they could buy a pair of socks from me. I tell them that I’ve only ever given the socks as gifts. I tell them that it takes me about two days to make them and the yarn costs between $15 and $20 and then ask them how much a pair of handmade socks are worth to them. They usually answer $20. Since that’s not a very reasonable trade of products and services, I then seriously offer to teach them to knit their own socks for free. No one has taken me up on this offer (Little do they realize that if they took the time to knit with me that we might become great friends, and then I might come to love them enough to want to knit a pair of magic socks for them). These are gift socks. They are made with love and good intent given freely to the wearer. These things and these socks can’t be bought. This pair was given to my sweetheart for Valentine’s Day. This entry was posted in Clothing and tagged Craft, craftsmanship, creativity, fabric, hand-made, Knitting, Textile, with love. Bookmark the permalink. I think that if Hobbits wore socks, they would wear these socks! I want some. I only knit on knitting looms, which makes life easier. But I do have a book that tells me how to make socks on the loom.